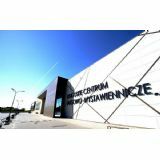 The Kujawsko-Pomorskie region has been a leader in manufacturing tools and processing plastics in Poland and Europe for years. It is called the Polish toolvalley for a reason - several hundred enterprises engaded in manufacturing tools for processing as well as processing itself operate here. The INNOFORM cooperative trade fair will be an excellent business platform and a place where manufacturers, distributors and scientists can exchange knowledge and experience with professionals who use advenced technologies at their plants.